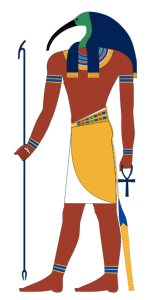 As Harsiesis, he is “Horus, the son of Isis”. Horus was conceived magically by Isis following the murder of his father, Osiris. 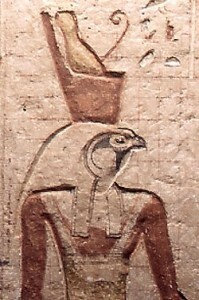 Horus was raised by his mother on the floating island of Chemmis near Buto. He was in constant danger from his evil uncle Seth but his mother protected him and he survived. As a child, Horus was known as Harpokrates, “the infant Horus”, and was portrayed as a baby being suckled by Isis. He was said to be stunted from the waist down. This may be because his father was dead when he was concieved or perhaps because he was born prematurely. Harpokrates is pictured as a seated child sucking his thumb and having his hair fashioned in a sidelock that symbolized his youth. On his head he wore the royal crown and uraeus. In later times he was affiliated with the newborn sun. As Harmakhis, “Horus in the Horizon”, he personified the rising sun and was associated with Khepera as a symbol of resurrection or eternal life. Haroeris, “Horus the Elder”, was one of the earliest forms of Horus and the patron deity of Upper (southern) Egypt. He was said to be the son, or sometimes the husband of Hathor. He was also the brother of Osiris and Seth. He became the conquerer of Seth (the patron of Lower Egypt) c. 3000 BCE when Upper Egypt conquered Lower Egypt and formed the united kingdom of Egypt. He was depicted as a falcon-headed man, sometimes wearing the crowns of Upper and Lower Egypt. Horus (the elder) had numerous wives and children, and his ‘four sons’ were grouped together and generally said to be born of Isis. The four were known as: Duamutef, Imsety, Hapi and Qebehsenuef. They were born from a lotus flower and were solar gods associated with the creation. They were retrieved from the waters of Nun by Sobek on the orders of Re. It was believed that Anubis gave them the funerary duties of mummification, the Opening of the Mouth, the burial of Osiris and all men. Horus later made them protectors of the four cardinal points. In the Hall of Ma’at they sat on a lotus flower in front of Osiris. Most commonly, however, they were remembered as the protectors of the internal organs of the deceased. Each son protected an organ, and each son was protected by a goddess. Horus Behdety was a form of Horus the Elder that was worshipped originally in the western Delta at Behdet. As the son and heir of Re, Behdety was a form of Horus that was assimilated into the Heliopolitan system of beliefs yet not completely identified with Re. Behdety was a defender of Re during his earthly kingship against Seth. He was usually portrayed as a winged sun-disk or as a falcon hovering over the Pharaoh during battles. When shown as a falcon-headed man wearing the double crown he carries a falcon-headed staff, the weapon he used to defeat Seth. Anubis is portrayed as a man with the head of a jackel holding the divine sceptre carried by kings and gods; as simply a jackel or as a dog accompanying Isis. His symbol was a black and white ox-hide splattered with blood and hanging from a pole. It’s meaning is unknown. Anubis had three important functions. He supervised the embalmment of bodies. He received the mummy into the tomb and performed the Opening of the Mouth ceremony and then conducted the soul in the Field of Celestial Offerings. Most importantly though, Anubis monitored the Scales of Truth to protect the dead from deception and eternal death. The god of embalming is probably associated with the jackel due to the habits of jackels to lurk about tombs and graves. One of the reasons the early Egyptians sought to make their tombs more elaborate was to keep the bodies safe from the jackels lingering about the graves. It is only natural therefore that a god of mummification would be connected with them. By worshipping Anubis, the Egyptians hoped to invoke him to protect their deceased from jackels, and later, the natural decay that unprotected bodies endure. 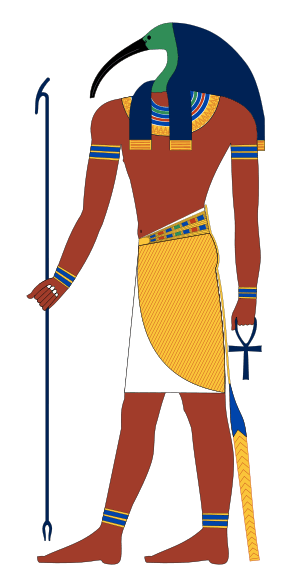 Anubis was the son of Nephthys: and his father was Osiris. 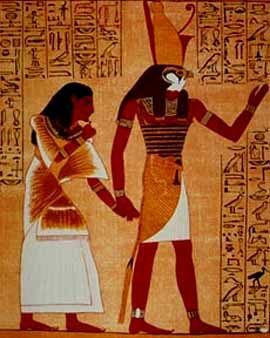 One myth says that Nephthys got Osiris drunk and the resultant seduction brought forth Anubis. Yet another says she disguised herself as Isis and seduced Osiris and subsequently gave birth to Anubis. The oldest religious texts refer to Osiris as the great god of the dead, and throughout these texts it is assumed that the reader will understand that he once possessed human form and lived on earth. As the first son of Geb, the original king of Egypt, Osiris inherited the throne when Geb abdicated. At this time the Egyptians were barbarous cannibals and uncivilized. Osiris saw this and was greatly disturbed. Therefore, he went out among the people and taught them what to eat, the art of agriculture, how to worship the gods, and gave them laws. Thoth helped him in many ways by inventing the arts and sciences and giving names to things. Osiris was Egypt’s greatest king who ruled through kindness and persuasion. Having civilized Egypt, Osiris traveled to other lands, leaving Isis as his regent, to teach other peoples what he taught the Egyptians. During Osiris’ absence, Isis was troubled with Seth’s plotting to acquire both her and the throne of Egypt. Shortly after Osiris’ return to Egypt, in the twenty-eighth year of his reign, on the seventeenth day of the month of Hathor (late September or November), Seth and 72 conspirators murdered him. They then threw the coffin in which he was murdered into the Nile, with his divine body still inside. Isis, with the help of her sister Nephthys, and Anubis and Thoth, magically located Osiris’ body. Upon learning the his brother’s body was found, Seth went to it and tore it into fourteen pieces and scattered them throughout Egypt. Isis once again found every part of his body, save his phallus (it had been eaten by the now-cursed Nile fish). She magically re-assembled Osiris and resurrected him long enough to be impregnated by him so that she could give birth to the new king Horus. Seth of course was not willing to surrender the throne of Egypt to the youthful Horus and thus a tribunal of gods met to decide who was the rightful king. The trial lasted eighty years. Eventually through Isis’ cunning she won the throne for her son. heavens or in the west. father was the new Osiris. poured sweet water in the Nile, declaring that the god was found again. (i.e., the strength of the Sun-god Ra. Another possibility raised by an ancient hymn’s author is that the name “Unnefer” (another name by which Osiris was known) comes from the roots un (“to open, to appear, to make manifest”) and neferu, (“good things”). The author then wrote these lines in his hymn to the god, “Thy beauty maketh itself manifest in thy person to rouse the gods to life in thy name Unnefer”. In any case, even to the ancients, the origin of Osiris’ Egyptian name is a mystery. The god of wisdom and learning. He was said to be self-created in the beginning along with his consort, the goddess Ma’at (truth). The two produced eight children, the most important being Amon. Alternately depicted as an ibis-headed human, an ibis, or a baboon (or dog-headed ape), perhaps because the grave facial expressions of these creatures suggested thoughtfulness. He carries a pen and scrolls with which he records all things. 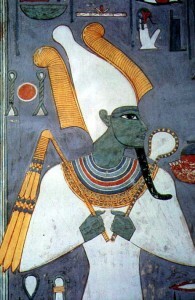 Thoth was believed to have filled many roles in the world of the gods. It was believed that he invented writing and was the vizier and official scribe of the afterworld, and that the Book of the Dead was written by him. He and Ma’at were believed to stand on either side of Re in his boat as he (as the Sun) traveled across the sky. It was thought that they also may have directed the course that the boat took. It was widely believed that Thoth invented the magical and hermetic arts, and thus the Tarot deck is frequently referred to as the “Book of Thoth” He was associated with the moon; as the sun vanished, Thoth tried to dispel the darkness with his light. Thoth is shown attending all major scenes involving the gods, but most especially at the judgement of the deceased. It is here that he (shown as a dog-headed ape) sits on the top of the balance that weighs the heart of the deceased to determine if it is as light as ma’at. The concept of ma’at is one of truth, justice, and “that which is straight”. It may even be related to “cosmic order”. The baboon Thoth informs the ibis-headed Thoth when the balance is at equilibrium. The ibis-headed Thoth then makes his report to the other gods who then pass judgement on the deceased.